1) Cut the lamb steak into long strips, about 2cm wide and 1cm thick. Mix the yoghurt and all the spices. Add the meat to the spicy yoghurt, mix thoroughly, cover and chill for at least two hours to marinate. 2) Add the couscous, boiling water and chicken stock to a large bowl, cover with a plate and leave for half an hour. Once the couscous has absorbed all the water, separate it with a fork so it’s nice a fluffy. Measure out two cups of cooked couscous and add the rest of the ingredients to it, mix lightly with a fork and set aside. 3) Mix the raita ingredients. 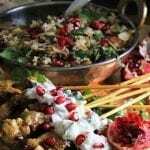 Leave a few of the pomegranate pips out so you can sprinkle them on top for the pretty. 4) Remove the meat from the fridge, sprinkle generously with salt and thread onto wooden skewers in a zig-zag pattern. Cook on the braai or in a hot pan with a generous glug of olive oil. 5) Serve kebabs right away with couscous, raita and lettuce on a large platter and let everybody build their perfect spicy Middle-Eastern wrap.